One of Avison's teachers, whom he met and studied with in London, was Francesco Geminiani - himself a pupil of Arcangelo Corelli. It should come as no surprise, then, that these concertos are written in the Italian style. The music is flowing and melodic, and there is a calming evenness of both temperament and rhythm. Avison's writing for solo instruments (violin, viola, or cello) demands excellent musicianship, but there is not the sort of showmanship one hears in Vivaldi's concertos, for example. More than half of the concertos are in four brief movements; the balance are in three or two. As Mark Kroll points out in his useful booklet notes, there are two particularly important features to note about this set of twelve concertos. One is Avison's emphasis on expression. (In fact, he went so far, at one point, to assert that expression was more important than the formal rules of composition – quite a provocative statement in 1752!) The other is the appearance of movements in a rudimentary sonata form, particularly in the later concertos. 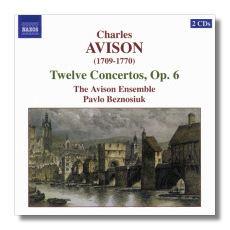 The Avison Ensemble is comprised of six violins (three firsts and three seconds), two violas, cello, and basso continuo (bass and harpsichord). The musicians play on period instruments, mostly from the 1600s, or on modern copies thereof. Unlike some of the more highly spiced ensembles from the European mainland (Europa Galante and Musica Antiqua Köln, for example), the Avison Ensemble favors a smooth, blended sound and rounded edges – you'd hardly know, much of the time, that this was a period ensemble at all. This is Baroque music played for relaxation and pleasure, not for drama or for conflict. It sounds like we can expect more from The Avison Ensemble – not just recordings, but also scholarship, and the discovery of more forgotten delights from the English Baroque. For more information, go to www.avisonensemble.com.